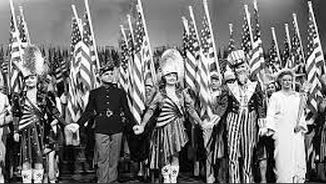 “Yankee Doodle Dandy”,”Music Man” & “Welcome to Me” All in ONE DAY! I exercised my Freedom, my inalienable right, to binge watch (or play the game HowManyMoviesCanISeeInADay?) until my eyes were screaming for relief. Then you stop. Lovely weather in NYC today. But here I was watching James Cagney winning an Oscar in 1944 for his great performance as George M. Cohan in “Yankee Doodle Dandy.” What a grand ole film! B&W but still resonates with any theater person(yeah, me)watching it. My fave scene – the theatrical boarding house where the Cohans are too poor to get served anything but molasses and noodles! Loved all the vaudeville scenes(and there are many). So close to the real life period, they’re bound to be more accurate than most other depictions. And “The Music Man” which I watched next on TCM, as well, is in vibrant color and a musical close to my heart. It was the first time I ever saw a Bway show, and this was IT. Sooo many memories. And “Welcome To Me” was just awful. I watched it BEFORE these other two great movies. I had a DVD screener of it sent to me and yes, I watched it all the way through. It’s got a premise that can’t be sustained for a whole film. A borderline personality goes off her meds, AND wins an $800 million lottery. An SNL skit maybe, it’s another vain attempt by Kristen Wiig to become a movie star. Not a TV star. And this was so bad, I felt myself longing for “The Skeleton Twins” another Indie in which she stared with Bill Hader. It was serious. They were brother and sister who had issues. He’s gay. She’s crazy. Or something. Well, she’s playing crazy again in “Welcome to Me” which might have been funny as an SNL skit (and perhaps it started that way) but blown up to an entire “comedy” OUCH! Her character, Alice Clieg (as in Kleig lights, Yeah we get it. NOT FUNNY!) decides to become the new Oprah and have her own talk show and spends most of her newly won dough on this horrendously misguided endeavor, which nobody stops, because she’s paying millions to do. They cover their asses by saying it’s a Public Access show. But this film was soooooo bad, I felt as someone who has devoted a major part of my life to Public Access, that it was insulting to Public Access. (Not an easy thing to do.) And you just hate her. Kristen Wiig is a very talented performer in all directions, but you can’t help but feel watching “Welcome to Me” that she’s losing her marbles.Shame.